Mike Compton has become one of the most influential mandolin players in acoustic music today. His personal contribution as performer and teacher has enriched and helped shape the emerging genres of both bluegrass and old time music. Born in Jimmie Rodgers' hometown of Meridian, Mississippi, Mike Compton was about 15 when he locked in on the mandolin. Everyone on his father's side of the family had played music for generations. His mother's grandfather played the violin but was gone before Mike ever had a chance to hear him play. However, his grandfather played guitar with a local fiddle hero which became the spark that would initially fire up Mike's lifelong appetite for acoustic music. “As a teenager, I got real interested in my lineage as my elders began to die out,” Mike said. “Compton's had lived in that area of the South for over 200 years.” He found that traditional music had been a mainstay in his family's households as far back as anyone could remember. His mother, while not a musician herself, loved music and heartily encouraged Mike to explore it to his heart's content. He started out on trombone with a little piano thrown in. His first guitar was a Yamaha FG-75. But once he received a Sears & Roebuck "Tater Bug" mandolin for his 15th birthday, he spent most of his time noodling away on that. Right around then his father built a Tandy Radio Kit giving Mike an opportunity to hear a variety of recorded music. It all appealed to him and he ate it up. Mike's family lived in a farming community. Mike reckons he was working on a hay truck when he first heard the tunes of Bill Monroe, the Stanley Brothers, and Flatt and Scruggs. He thought bluegrass was the most wonderful stuff he had ever heard and spent the next years with his nose buried deep in learning to play those songs lick for lick. Academically, Mike's creative side reached beyond the fretboard and won him an art scholarship to Meridian Junior College, where he studied for three years. When he was 21, Mike met Pat Enright on a summer trip to Music City. They hit it off well. Pat had a band in the works, and Mike was so interested that he left school and moved to Nashville. The band idea fell through but this left Mike free to join Hubert Davis and the Season Travelers whom he played with from 1977-1981. The legendary band played regularly at Davis' club, the original Bluegrass Inn, Nashville's first all-bluegrass haunt. Mike appeared on three of the group's recordings on RHD Records during his nearly four years as a member. When Davis passed away, Mike continued to work in the band with Davis' wife. In 1984, when Pat Enright and Alan O'Bryant began to put together the Nashville Bluegrass Band, Mike Compton was their first choice on mandolin. The band was like a marriage made in heaven. “We all sort of thought the same way about music,” Mike said. “The common ground was the old style sound.” Their blend of bluegrass, blues and traditional styles was an immediate hit and they had no trouble finding work. For the next several years, Mike traveled with NBB, performing at festivals, clubs and venues around the world. He appeared on NBB's first four recordings and was on his way to becoming one of the most respected mandolin players in bluegrass music. Somewhat in the role of a modern day pioneer, people began to talk about Mike Compton's craftmanship. He was a clearly a musician's musician. By late 1989 Mike had become weary of the music business. The group had had the serious bus accident that injured Mark Hembree, deeply frightening everyone in the band. While Mike wholeheartedly enjoyed the company of the other band members and the notoriety he was receiving, he decided it was time to find some other occupation. “I thought, 'This will never last forever' and figured I'd quit while I was ahead,” Mike said. He presented an official resignation to the Nashville Bluegrass Band and moved to the Catskill Mountains. He returned to Nashville within a year when he realized how much a part of his heart music occupied. He hooked up again with guitarist David Grier (the two had recorded a duet CD in 1989, Climbing the Walls) and toured the U.S. and Japan. Then, “I met John Hartford up in Norris at the Tennessee Homecoming Festival in '94. He had followed NBB and he said it struck him as good music. I spent a good deal of time with him up there, jammin' with him, listening to him tell me how wonderful it was being a single act, how nothin' could beat the freedom of that. He completely sold me on the benefits and virtues of working alone. Then he called me up the next day and offered me a job,” Mike laughs. Thus he became a sideman for John Hartford, whom he performed with until Hartford's death in June 2001. He had the honor of playing on Hartford's last CD, Hamilton Ironworks. Mike worked with other musicians during those years as well, often with David Grier; he was in and out of the studio frequently in those days, working with Chris Jones, Bill Evans, Keith Little and others, and in 2000 was invited to play on a soundtrack that would ultimately sell over 7 million copies: O Brother, Where Art Thou? Mike Compton officially rejoined the Nashville Bluegrass Band in January 2000, finally able to pick a few fruits from the musical tree he initially planted with Pat, Alan and Stuart. NBB had been very successful in his absence, due in some degree, to Mike's contribution in the early years. Luckily, the music hadn't wandered far from the performance style the four had perfected together. It felt mighty good to be back home. The following year was a whirlwind. O Brother Where Art Thou went platinum and waltzed away with the Best Bluegrass Album Grammy and IBMA's Album of the Year. The Nashville Bluegrass Band joined the O Brother CD promotional tour that year, and in 2002 the follow up Down From The Mountain tour. With NBB one of the acts, Mike played in the house band that backed up most of the performers. Proud of their homeboy, the Mississippi State Senate honored Mike in 2002 with State Resolution Number 45, a special honor commending his musical accomplishments. He received the Resolution on the Senate floor and after thanking them, played Bill Monroe's Old Ebeneezer Scrooge and I'll Fly Away, inspiring the senators to sing along. In the pockets of time between NBB performances, Mike has continued to work and record with other artists, including John Hartford, Patty Loveless and James Monroe. He played on the soundtrack to the civil war epic Cold Mountain in 2003 and Bruce Molsky's 2004 release Contented Must Be. He's often found onstage with mandolinist David Long, an electrifying mandolin player he met at the Mohican Bluegrass Festival in Central Ohio in 1999; the two recorded a CD together in 2006 entitled Stomp. 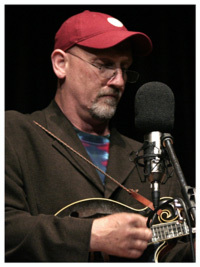 Mike appeared on the critically acclaimed Tone Poets album produced by David Grisman in 2005. Today Mike travels the world playing the music he loves. He also gives private instruction in Monroe-style mandolin online, giving as many as 40 lessons in a week. He picks up fans and students wherever he goes - and his outreach is definitely going global. He spent six weeks in Australia early this past spring, his second visit in recent years, and there are plans for a trip back next year. His favorite mandolins are Gilchrist and Mike owns two, a 2002 F-5 and a 2003 F-4 with an oval hole. More a sentimentalist than a true collector, he kept his old 00 12-fret Regal slothead guitar from the mid-30's and has acquired a few other old instruments from the mail-order days. He also owns a Bruno A model from around 1920, one of his favorites.